I’ll never forget the first time I was in charge of desserts for a Thanksgiving dinner. Yes, it’s not like I’m a grandma and it was over 50 years ago, but like I’ve mentioned before, I didn't fully get into baking until after college. In 2013, my Thanksgiving was very low-key that year and only consisted of me, my mom, my sister and her now-husband for dinner; a small get together but we had a really fun time nevertheless. Even though I knew it was going to be just the four of us, I went completely over the top with planning the desserts since it was my first time and ended up serving 4 (!!!) dishes. The 4 dishes - a deep dish apple pie with a side of spiced caramel, chocolate chip cookies, cranberry hand pies, and today’s recipe of maple pecan ice cream - were a lot of work. But I remember being so happy and excited to feed my family that day that I didn’t care if I was in way over my head. Every night of the week leading up to the big day, I prepped and worked on different components of the 4 dishes (while also helping my mom with the main meal) and despite being told that I didn’t need to put so much effort into it because it was only going to be “us”, I kept my head down and finished what I started. And everything honestly came out great, surprisingly! The high I felt from accomplishing something like that was 100% worth it all. Every Thanksgiving since then, I’ve calmed down a bit on the quantity of desserts and have shifted my focus on making a couple of really, really good dishes. Besides returning year after year to the pumpkin cheesecake recipe I gave you earlier this week, I sometimes opt to re-make the maple pecan ice cream that I first tried in 2013. Not that many people think to make homemade ice cream for Thanksgiving. Of course, this is because it’s just another thing that would need to be added to an already long to-do list and not everyone has the time. The norm for most people, and trust me, my family does this as well, is to buy a big ole tub of vanilla ice cream for anyone that may want a scoop with their slice of pie. And chances are, only about a 1/3 of the party will want some, whereas another 1/3 would prefer whipped cream, and the remaining would prefer nothing. 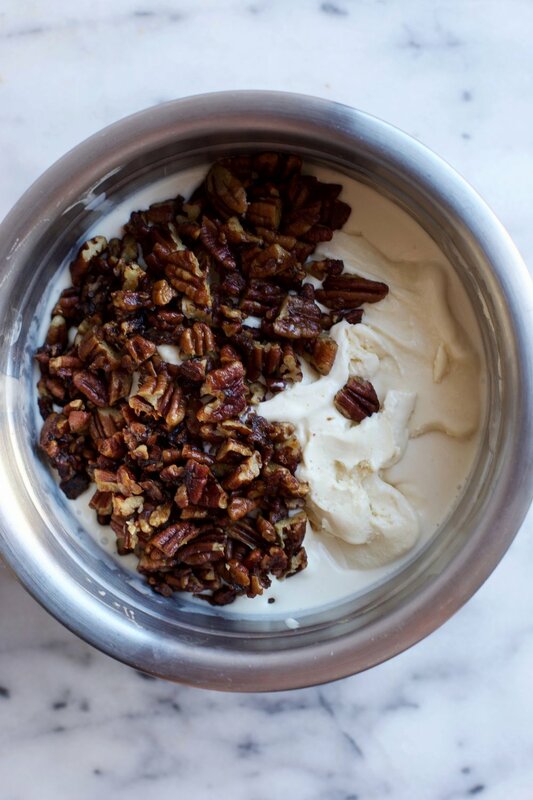 But l wholeheartedly believe that this maple pecan ice cream will be requested by EVERYONE at the dinner table. Unless you have nut allergies, and if you do, I apologize because you are missing out! First of all, the flavor alone is pretty unique and something that you wouldn’t be able to find in the freezer section of your local grocery store. There is of course the ever so popular “Butter Pecan” flavor that most people are familiar with, but this ice cream is definitely on a whole different level, largely due to the maple syrup aspect. 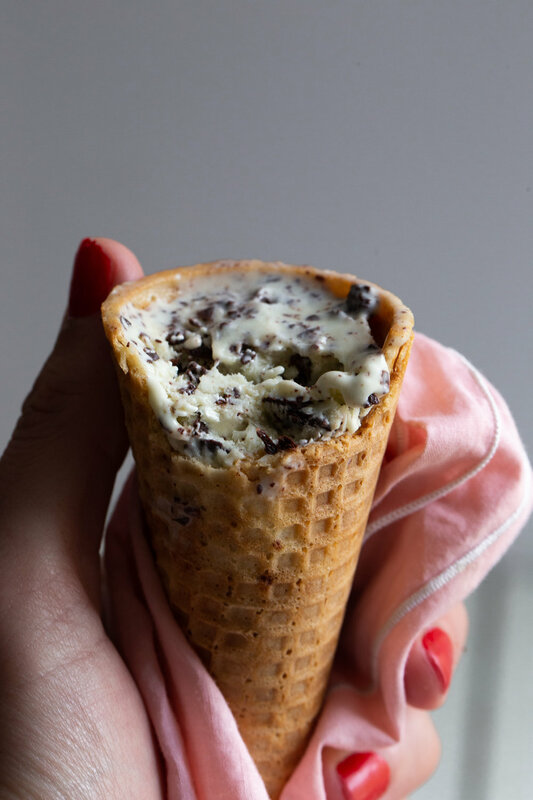 The ice cream base is only sweetened by pure maple syrup (the good stuff, not Aunt Jemima’s) and in fact, the only “sugar sugar” found in this recipe belongs to the candied pecans that are folded in with the maple ice cream after it’s churned. And speaking of those candied pecans - that are simply cooked with butter and brown sugar - they add such an incredible flavor and crunch to the ice cream that it makes it unbelievably addicting. There’s a full cup of pecans in this recipe and that’s because I want you to get pecans with every bite. This ice cream is custard based - the best ice creams are - and so this means that you’ll have to temper the eggs when making the base. But besides that little step, everything else is fairly simple! And what’s most important is that you can make this days (but no more than a week) before Thanksgiving and thus have more time to give to your turkey, stuffing, and other desserts. I say give this maple pecan ice cream for Thanksgiving a try and you’ll see how your guests (or hosts) go completely insane over it. And for those who still take the whipped cream over the ice cream: they will never know what they’re missing. Melt the butter in a large skillet. Add the chopped pecans and toss to coat with butter. Sprinkle in the brown sugar, and cook for 3-4 minutes, or until the pecans are candied. Transfer to a bowl and allow to cool completely. Warm the milk, heavy cream, maple syrup, and salt in a saucepan over medium-low heat. In a medium bowl, whisk the egg yolks together. Just as the milk mixture is beginning to simmer, gradually add some of it to the bowl of egg yolks, whisking constantly as to not scramble the eggs (this is called tempering). Once the egg yolk mixture temperature has raised, pour the mixture back into the saucepan. Stir constantly over medium-low heat until the mixture thickens and coats the back of your spatula or spoon. Transfer the mixture to a bowl set over an ice bath for about an hour before moving to the refrigerator. Chill for at least 4 hours, or overnight. Churn the ice cream in your maker according to the manufacturer's instructions. Transfer to an airtight container and mix in the candied pecans. Freeze until solid.